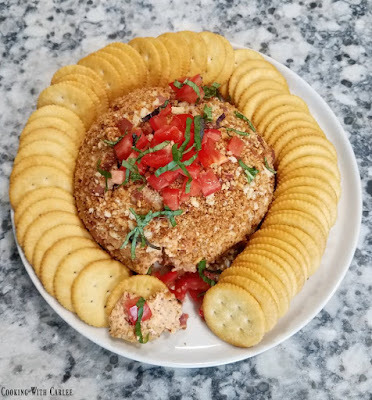 Bacon and bruschetta get all cozy together is a fun cheese ball that is a perfect summer appetizer. Summer is definitely here, even if the calendar says it's a few weeks off. The tomato plants are blooming and outdoor entertaining season is upon us. Now that there are kiddos in the mix, that means we tend to get together earlier for get togethers and scatter not too long after dinner gets off the grill. Earlier start times mean snacks are in order. This cheese ball is a perfect make ahead starter that everyone will love. Grab some basil from the garden and some of those fresh tomatoes that will be here soon and make this puppy ahead of time. Then just garnish and grab some crackers or sliced baguettes and you are ready to go! Not in the mood to make a cheese ball? Just put it in a bowl and sprinkle with the bacon breadcrumbs for an even lower fuss appetizer. I haven't tried it yet, but I can totally see this spread in a small casserole and baked. Doesn't that just sound lovely? It would be a gooey, cheesy, bacony warm cheese dip. Now I can't wait to give that a go! I brought this as a starter for our Memorial Day cookout at my parents'. The family put a pretty big dent in it. Little Dude was convinced he found the cheesy spot and put a decent crater in it himself. So if you would like to be the cause of the next celebration, I suggest you whip up this cheese ball. Some friends and I are celebrating national cheese day today, so make sure to check out their recipes as well! Here are some more great options to celebrate National Cheese Day! If using slices of bread, process them in your food processor to make crumbs or tear them into very small bits. Chop the bacon and place half of it in a skillet. 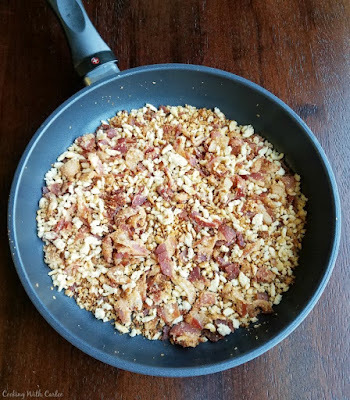 Toast the bread crumbs with the bacon and 1/4 teaspoon of garlic powder to get it all toasty and covered with bacon and garlic goodness. I like to let the food processor do the work for me when making cheese balls. So, I processed the roma tomatoes, the other half of the bacon and the basil until it was pretty finely chopped. Alternatively, you could do that with a knife. Mix the basil, sun dried tomato mixture with the red pepper flakes, salt, pepper and the other 1/4 teaspoon of garlic powder. Stir (or process) in cream cheese, mozzarella, Parmesan and balsamic vinegar. Chop the roma tomatoes and fold into the cheese mixture. Spoon onto a piece of plastic wrap. I like to wrap the cheese mixture and use the plastic wrap to help me shape the ball. Refrigerate for at least an hour to firm up the cheese ball. Roll the ball in the bacon bread crumbs. Garnish with additional chopped tomatoes and basil if desired. Serve with toasted baguette slices or crackers. Oh Carlee, what a winner!! 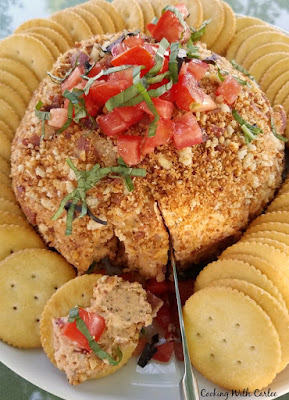 The perfect Summer Cheese ball I ever did see especially for a Bruschetta lover like me! Ha ha, I realized that rhymed, lol! I hope the weekend festivities were wonderful!! Ha! You're a poet and you didn't know it! So many of my favorite things! This is going to be a huge hit here! It was a hit here, that is for sure! Thank you! This sounds amazing. Can't wait to set this out at our first pool party of the year. I hope it goes over big with your crew! I love a good cheese ball! And I don't make them nearly enough. I think this one will make it into the summer rotation and last through football season too! I don't make them as often as I should either! They are delicious and so much fun! It would be great for tailgating! Oh, my goodness this looks amazing, Carlee! I can't wait to try this. It is funny but when I think of cheeseballs, I think of Christmas and New Years. When I saw this post, I thought what a perfect time of year for a cheeseball. Sometimes I need just a push to push me out of the box. I am going to make this for a family get together that we have in a few weeks. Christmas and New Years do seem to be the cheese ball holidays, but I think we should enjoy them year round! I hope you love it! 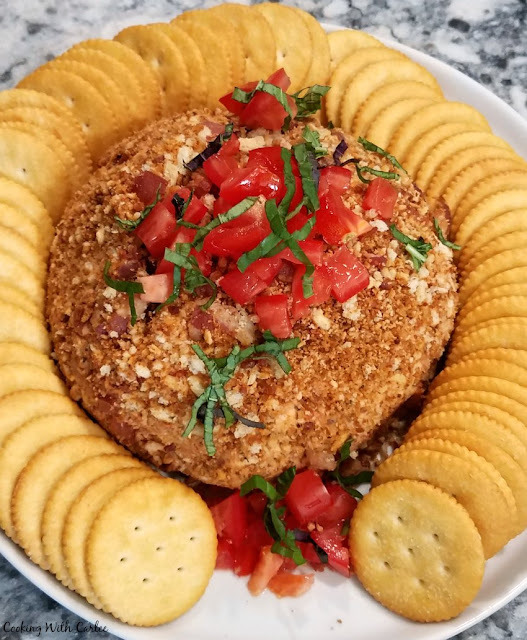 I love how flavorful this yummy bacon bruschetta cheeseball filled with bacon, sun dried and Roma tomatoes and of course cheese. We spend a lot of time either at the beach or by the pool in the summer. We always have a pot luck, this is now in my rotation.I am sharing this with my friends, they will love it. Yay! I hope you all love it as much as we did! Hi Carlee, I remember last year you posting cheese bal recipes and it was something I'd never heard of. This one I really must try, the combination of flavours is right up my street. Just need a reason now... Maybe "just because"? Just because is my favorite reason! This looks delicious! I love making cheese balls for parties so I can't wait to try your recipe. Oh yum Carlee. I need to have some friends over so that I have an excuse to make this! Oh boy, I need to find a gathering to make this for! This sounds sooo good! This looks like a savory treat that my family will love. Thanks for sharing at Snickerdoodle, Carlee! I'll be featuring this at tomorrow's party. Hope to see you there! I hope they do love it! Thanks! A great combo for this awesome appetizer! Hope you are having a great week and thanks so much for sharing your awesome post with us at Full Plate Thursday! Carlee, this is definitely the perfect summer appetizer.There's always room for bacon in any recipe I always say! Not sure what could be better. ;-D Thank you for sharing this at Whimsical Wednesdays Link Party! Mooooooore bacon please! I agree, there are very few things it doesn't belong with!